Does evidence support calls for an advertising ban on alcohol? To him and the large number of public health bodies that put their name to a submission to the Health Select Committee the answer is to ban alcohol advertising entirely. 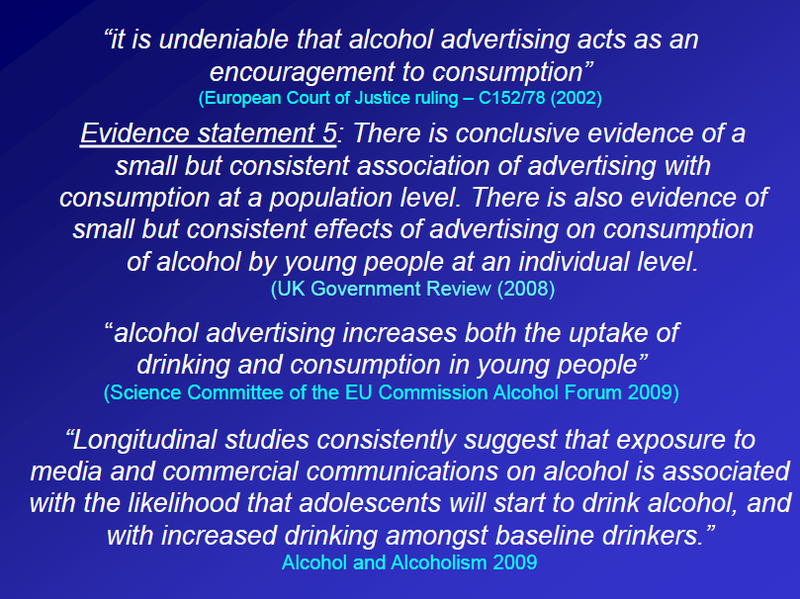 There is a lot of evidence to suggest that Sir Ian is right about the impact of alcohol adverts on young people. after controlling for confounding variables, involvement with alcohol marketing at baseline was predictive of both uptake of drinking and increased frequency of drinking. Awareness of marketing at baseline was also associated with an increased frequency of drinking at follow-up. As Gerard Hastings points out in a fascinating presentation given to the EU’s Committee on National Alcohol Policy and Action in April this year this has been understood for some time [see right]. Whilst there are academic advocates for banning advertising the evidence doesn’t seem to be as strong as it could be. Studies examining the effects of alcohol advertising on consumption do not support or counter a hypothesis for a causal relationship. This is mainly attributable to the considerable variation in the use of advertising bans across countries and methodological challenges. It should also be recognised that imposition of a ban may require an extended period of time, within which to affect consumption and even longer to have an effect on harms. Evidence statement 11: There is some inconclusive evidence that suggests that advertising bans have a positive effect in reducing consumption. Differences in contextual factors are a likely explanation for these differences. It is methodologically challenging to control for all possible confounding factors. Evidence statement 12: There is some evidence to suggest that bans have an additive effect when accompanied by other measures within a general environment of restrictive measures. To date, research has tended to rely on simplified models of marketing and has focused disproportionately on youth populations. The effects of cumulative exposure across multiple marketing channels, targeting of messages at certain population groups and indirect effects of advertising on consumption remain unclear. Participants also indicated that they were largely unaffected by alcohol advertising online, and while this seems unlikely given the persuasive and effective nature of advertising, only 12% of alcohol content online represented identifiable instances of marketing, so it would seem likely that effects transmitted through interacting with and absorbing alcohol media came mostly from sources that were not advertising.